Cake Toppers – io9 put together a list of “nerdy” wedding cake toppers, many of which have a goth theme. Flip-top Zombie Shirt – This is hilarious. Skeleton Mirror – Very cool life-size laser cut mirror. Not terribly functional, but awesomely stylish. Haint Blue – Neat article at Curious Expeditions about a paint color often found in the south. Spook House Dave – New online puppet series about a 12-year-old boy being raised by monsters. I don’t know much about this; it was sent to me by a promoter, but you can take a look if you’re so inclined. Faceless Autumn – A gallery of masks, either for purchase or DIY inspiration. The Great Internet Migratory Box Of Electronics Junk – Interesting project from Evil Mad Scientist Labs. If you tinker with electronics and have a lot of leftovers, you might want to get involved. Creepiest Vintage Ads of All Time – A couple of these would be amusing as posters. 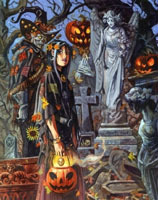 Dan Brereton is a writer and illustrator who’s perhaps best known for his comic series Nocturnals, which follows the exploits of a creepy band of supernatural heroes. His style is lush and colorful while still being dark. Geek Orthodox recently posted several of his images, and there are lots more in the gallery at Brereton’s site. They all have sort of a comic book/pulp fiction feel to them, but several of them are attractive enough to hang on a wall. Pretty! Go look! I always knew Grover was a badass. Here’s a little something for Edward Gorey fans: in the 60s, Gorey illustrated a 20-card “tarot” pack for Esquire magazine. It was eventually published as an actual deck, along with an interpretation booklet also written by Gorey. The cards have titles like “The Waltzing Mouse,” “The Burning Head,” and “The Limb,” and although tarot enthusiasts warn that they aren’t much good for actual fortune-telling (duh), they’d be a wonderful part of a collection. Or just frame them individually and hang them as art. It’s hard to go wrong with Gorey. After announcing more than two years ago that a musical was in the works, the show is finally scheduled to premiere in Chicago in November and will open on Broadway next April. Nathan Lane will play Gomez and Bebe Neuwirth is Morticia (which seems like a solid choice to me). Also cast are Kevin Chamberlin as Uncle Fester, Jackie Hoffman as Grandma and Zachary James as Lurch. Scheduling and ticket information is available at their site. A Link Dump! How Wonderfully Unexpected! Palimpsest Review – io9 reviews a book with an interesting premise: A city you can only visit if you sleep with someone who’s been there. It sounds odd and rather spooky. Custom Six-Pack – Instructions on changing out the artwork on a six-pack of commercial beer for something custom. This was a project for Fathers Day, but it’d make a nice gift any time of year. Wedding Invitation – A highly original wedding invite. Reclamations – Artist Thomas Doyle combines miniature figures with found objects, creating strange and disturbing vignettes. Skeleton Doggie – I love the body paint on this pooch. Spider Catcher – Interesting DIY device made out of an old audio cassette holder. If you’re squeamish about picking up spiders but don’t want to kill them, this might be a useful tool. The Bazaarium – Victorian-ish stuff, mostly prints and other paper items. Their “silhouette” series is hilarious. Easy Fabric Mask – Tutorial on making quick and easy domino-type masks. Tactical Corsets – Just in case you expect to be shot at while stripping. LED Ghosties – Evil Mad Scientist Labs has a cute project for Halloween. I like shirt.woot: They sell a different T-shirt every day, and their commentary is hilarious. My pal Kitten Herder recently hit their site and sent me a bunch of links that she found amusing. I love it when somebody else writes half my blog post for me. Nevermore – An image of a raven composed of the words of Poe’s poem. Grim Optimism – Death comes for a cute little squirrel. Donut Panic – A jelly doughnut meets a grisly end. 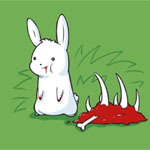 You Have to Try This Guys – This is the kind of bunny that I suspect lives around my house. It Came Out of Nowhere – More geeky than gothy, but it amused me anyway. Dystopia Dark Lager – The heck with a shirt, I want beer labels with this imprint. No longer available, but these also amused me: Friends Are Forever, Jimmy…is That You?, and The Devil is in the Details. Oh boy, do I love these shoes. Patricia at Fashion Mongers was inspired by a pair of “Christian Louboutin for Rodarte” spike heels with studs to create a DIY knockoff. She added cheap metal studs (many cannibalized from an old belt) to a pair of plain black heels, and the results are gorgeous. She’s got lots of pictures and construction details at her site. If you’ve got a pair of plain heels you’re tired of, this would be an amazing way to give them a new lease on life. This isn’t exactly goth, but it made a sufficiently big splash in the crafting community that it’s worth mentioning. 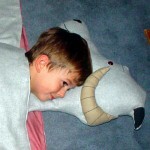 ThinkGeek’s most recent April Fool’s newsletter featured a fake Tauntaun Sleeping Bag which made the internet overflow with fanboy drool. Quirk Books, publisher of Pride and Prejudice and Zombies, has produced a sequel. 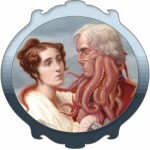 Sense And Sensibility And Sea Monsters promises “60% Austen and 40% additional monster chaos,” while still remaining true to Austen’s original novel. As our story opens, the Dashwood sisters are evicted from their childhood home and sent to live on a mysterious island full of savage creatures and dark secrets. While sensible Elinor falls in love with Edward Ferrars, her romantic sister Marianne is courted by both the handsome Willoughby and the hideous man-monster Colonel Brandon. Can the Dashwood sisters triumph over meddlesome matriarchs and unscrupulous rogues to find true love? Or will they fall prey to the tentacles that are forever snapping at their heels? The book is due out September 15, so mark your calendars.